How many of us crave cold, quenching drinks when the sun is out? How many of us turn to frappuccino’s, iced drinks, packaged fruit juices, sodas and beverages from Starbucks, Costa, Caribou, Dunkin’ Donuts, Pepsi, Coca Cola, Capri Sun and the like? Do we really know how much sugar we are consuming? Or do we just focus on the calorific content and think I will just cut down on what I eat today? Added Sugars, not fat, is one of the biggest culprit and single worst ingredient behind the obesity epidemic and various diseases, such as, obesity, type II diabetes and heart disease! It provides calories with no added nutrients and can damage your metabolism in the long run. It is an addictive drug, similar to cocaine and alcohol. However, the difference is that we don’t sell alcohol to anyone under the age of 18, but you can buy high-sugar content foods at any age. It is very important to make the distinction between added sugars and sugars that occur naturally in foods like fruits and vegetables. The latter comprise of water, fiber and various micronutrients. Whilst, added sugars are those that are added to processed foods, such as, sucrose (regular table sugar) or high fructose corn syrup (HFCS). So how much is too much? If you want to lose weight and optimize your health, then you should do your best to avoid foods that contain added sugars, read nutrition labels on packaged foods, and try to cook food from scratch so you know exactly what is going into it. 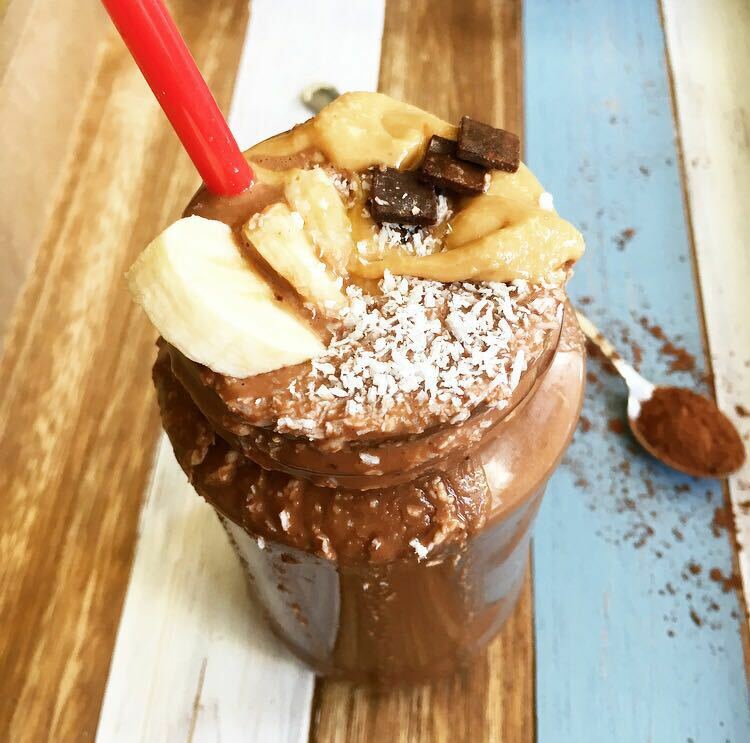 Today, I will share with you a yummy, 5 ingredient (unless you want to include the ice then its 6) Chocolate PB Smoothie that is homemade, natural and whole. Combine all the ingredients in a blender and blend until smooth or you hit the consistency you like. I like to garnish mine with sliced bananas, peanut butter or coconut. Would love to hear your thoughts ? Sahtein! Bon appétit! Enjooooy!